Welcome to Big Bear Resort Pigeon Forge, your cabin rental destination for family fun in the Smoky Mountains! Big Bear Resort cabin rentals are located less than a mile off the action packed Pigeon Forge Parkway filled with dozens of attractions, shows, restaurants and seemingly endless adventure. Come enjoy this terrific family resort setting with both, a summertime outdoors swimming pool and year-round indoor pool close to all the action! 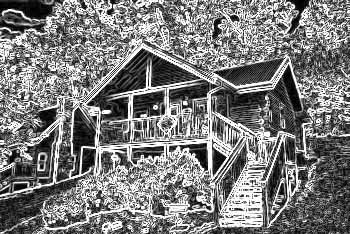 Your Big Bear resort rentals provide affordable elegance and stunning views of the Tennessee Great Smoky Mountains area. Easily catch the Pigeon Forge Fun Time Trolley at the stop at the entrance of the resort for travel through Pigeon Forge and into Gatlinburg or all the way to the Ole Smokies Stadium for a baseball game. Love longer walks, paved sidewalks starting at the resort entrance carry you all the way into downtown Pigeon Forge, the hub of Tennessee Smoky Mountain family attractions. Our cabin condos & duplexes in Big Bear Resort are bound ot offer plenty of comfortable amenities for your stay! While planning your family vacation to the Pigeon Forge Smokies area you may wish to view our Smoky Mountain Area Information for insights on all there is to see and do in the action packed Tennessee Smokies! You can also plan your cabin vacation around the dozens of Pigeon Forge Events occurring throughout the area. Be sure to SAVE when you book your Big Bear Lodge Resort cabin rentals online with Cabins USA with an immediate Online Cabin Discount!